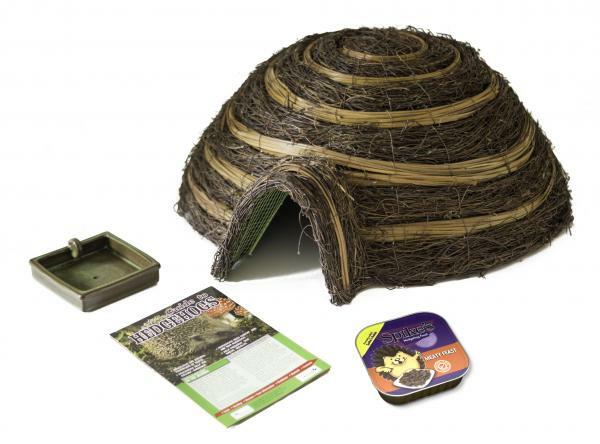 This hedgehog house is the perfect way to help the hedgehogs in your garden. It provides valuable shelter where the hedgehog can hide away from predators such as cats and dogs and be protected from human activities such as setting of bonfires, garden forks and strimming. The house is made from a sturdy coated steel frame with water-resistant felt roof and natural brushwood finish. The narrow entrance tunnel provides a deterrent to predators and the house may be further camouflaged with branches and foliage. The Hedgehog house comes with a Care pack containing a snack bowl, 100g of Spikes meaty feast food and a guide to Hedgehogs..